Participating in our community and enjoying our content means you need to read and agree to these terms and conditions. 1.1. 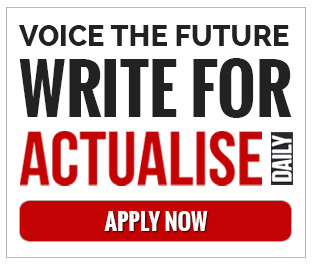 Welcome to www.actualisedaily.com (Website). The following terms and conditions (Terms) as set out below will apply to all services provided by Equilibrio International Pty Ltd trading as Actualise Daily ACN 118 218 536 (Actualise), including but not limited to the Website and social media pages and any information provided by us (the Services). In these Terms, “we” “us” and “our” refers to ACTUALISE. 1.2. We may change all or part of the Terms at any time. If we do, the new Terms will be posted on the Website. Your subsequent or continued use of the Services will constitute your acceptance of any changes. If you object to any changes to the Terms, your only remedy is to immediately discontinue your use of the Services. 1.3. By using our Services, you represent that you are at least 13 years old. Persons who are at least 13 years of age but under the age of 18 may only use our Services with legal parental or guardian consent. However, in order to access some of the Services, such as the ezine, you must provide us with your personal details and confirm you are over the age of 18. We reserve the right to implement restricted access and age verification mechanisms as we deem appropriate. f. for any unlawful purpose. 1.5. We do not represent or warrant that our Website or any content complies with the laws of any country outside Australia. If you reside outside Australia please feel free to read and enjoy our Services, however, you do so at your own risk. 2.2. We will make offers to you to attend webinars, events or to purchase products from our contributors. When you sign up to our ezine you will be given the opportunity to opt-in to receiving these offers. If you choose to receive these offers and later change your mind, you may unsubscribe by clicking on the link at the bottom of the email. g. contains viruses, or other computer codes, files or programs designed to interrupt, limit or destroy the functionality of other computer software or hardware. d. unconditionally waive all moral rights (as defined by the Copyright Act 1968) which you may have in respect of the Content. 3.3. We reserve the right to review, modify, reformat, reject or remove any Content which you provide to us for publishing, upload, post, transmit or otherwise make available (or attempt to upload, post, transmit or otherwise make available) to us, for any reason whatsoever. 3.4. We reserve the right (but have no obligation) to monitor use of the Website, and store or disclose any information that we collect, including in order to investigate compliance with the Terms or for the purposes of any police investigation or governmental request. 3.5. We are not responsible for, and accept no liability with respect to, any Content uploaded, posted, transmitted or otherwise made available on the Website or Social Media Pages by any person other than us. For the avoidance of doubt, we will not be taken to have uploaded, posted, transmitted or otherwise made Content available on the Website or Social Media Pages simply by facilitating others to post, transmit or other make Content available. Furthermore, we do not endorse any opinion, advice or statement made by any person other than us. 4.1. This website contains “cookies”, which are used to optimise the efficiency of the Site for the user. A cookie is a small text file that contains information and is stored on a user’s computer when the user visits a website. Cookies are used to count the number of visitors and analyse traffic, and to assist with targeted advertising. 4.3. Anonymous information about the previous webs browsing activity of your computer may be collected by advertisers and used to associate your computer with one or more pre-defined interest categories. Advertising that matches those interest categories may then be served to your computer. This interest based advertising does not change the amount of advertising you receive, it just makes it more relevant. 5.1. Our Services may link to third party websites or social media pages which are not owned or operated by ACTUALISE. We are not responsible for the content on, and the terms and conditions pertaining to, these external sites. We recommend that you investigate these sites own terms and conditions. 6.1. You acknowledge that ACTUALISE will not be subject to, nor incur, and release ACTUALISE from, any loss, claim, action, or liability for consequential loss or damage to you or any third party, including any loss of business, revenue, profits, non delivery, conduct or things done, permitted or omitted in relation to providing of the Services including but not limited to your use of the Website. 6.2. You acknowledge that to the extent permitted by law (including the Australian Consumer Law) ACTUALISE’s liability is strictly limited to the provision of the Services again or the payment of the cost of having the relevant Services being provided again at the option of ACTUALISE. 6.3. You acknowledge that any statement made by ACTUALISE in relation to the characteristics and potential application of the Services are made in good faith to assist you and ACTUALISE will not be bound or held to those representations whatsoever. c. any unauthorised access to the Website or the information retained on the Website. 7.2. The information as contained on the Website and Social Media Pages is provided on an as is basis with no warranty express or otherwise implied relating to the accuracy, fitness for purpose, compatibility or warranty as to their security. 8.1. You indemnify and will at all times keep ACTUALISE indemnified against any action, claim, suit or demand, including a claim, suit or demand for or liability to pay compensation or damages and costs or expenses arising out of or in respect of any breach or any use of the Services. 9.1. You acknowledge that all intellectual property of ACTUALISE such as trademarks, trade names, patents, registered designs, copyright and any other form of intellectual property rights derived from aesthetics or functionality of the Services or any other material or content created (including, but not limited to, Content written by Actualise) or provided by ACTUALISE remains the property of ACTUALISE. 9.2. You warrant that you are entitled to use any intellectual property used by you in relation to the Services, including content provided to ACTUALISE to display on the Website and Social Media Pages. 9.3. You indemnify and will at all times keep ACTUALISE indemnified against any action, claim, suit or demand, including a claim, suit or demand for or liability to pay compensation or damages and costs or expenses arising out of or in respect of any breach of any third party’s intellectual property rights. 9.4. You must immediately notify ACTUALISE of any claim, demand, threat or notice of proceedings against you relating to any breach of intellectual property rights. 9.5. If you upload photographs, audio or video recordings of yourself, you consent to give ACTUALISE the right to use these photographs and recordings in the production of ACTUALISE content. You will further allow ACTUALISE the right to use or reproduce your likeness in whole or in part for publicity or broadcast purposes as they reasonably see fit. 9.6. If you upload or provide us with Content, you agree to indemnify us against all liability claims or proceedings whatsoever arising from the publication of such Content in relation to defamation, breach of copyright, infringement of trade marks or names of publication titles, unfair competition, trade practices, royalties, violation of rights or privacy. You further warrant that the Content complies with all relevant laws and regulations and that its publication will not give rise to any rights against or liabilities to us and our business partners. If you post Content or links from the Website or Social Media pages that infringe any third party rights, you will indemnify ACTUALISE against any loss, liability, damage, cost (including ACTUALISE’s reasonable legal costs) or expense arising out of or in connection with any failure on your part to obtain any necessary rights, consents, licenses or permissions or your conduct on the ACTUALISE Website or Social Media pages. 10.1. We undertake to take all due care with any information which you may provide to us when accessing the Services. However we do not warrant and cannot ensure the security of any information which you may provide to us. Information you transmit to us is entirely at your own risk although we undertake to take reasonable steps to preserve such information in a secure manner. We do not warrant or represent that the Website or the Services will not be subject to unauthorised access. 11.1. These Terms are the complete and conclusive statement of the agreement between you and ACTUALISE in relation to the Services provided by ACTUALISE to You. These Terms may not be varied, amended, waived, altered, supplemented, modified or added to, without the express written agreement of ACTUALISE. 11.2. If any of the provisions set out in these Terms are determined to be void or unenforceable then that provision must be read down to avoid that result or if the provision cannot be read down then it must be severed and the rest of the Terms will remain in full force and affect. 11.3. The failure of ACTUALISE to enforce any provision of these Terms at any time or for any period of time will not be construed to be a waiver of such provision or of the rights of ACTUALISE to enforce each and every provision of these ACTUALISE. A waiver of a power or right will be ineffective unless in writing and executed by ACTUALISE. 11.4. These Terms shall take effect and be construed in all respects in accordance with the laws of the State of New South Wales. The parties irrevocably submit to the jurisdiction of the State of New South Wales for all proceedings arising in connection with these Terms.